^ 1.0 1.1 1.2 1.3 辭海編輯委員會 (编). 《辭海》（1989年版）. 上海辭書出版社. 1989. ^ Osamu, Aizawa. Rekishi ga omoshiroku naru tōdai no dīpu na nihonshi. Tōkyō: Chūkeishuppan. : 49. ISBN 978-4806143796 （日语）. ^ 林韦; 徐荇; 苏沛. ʻʻ四人帮ʾʾ 批判. 中国社会科学出版社. 1983 （中文（中国大陆）‎）. ^ 黃金麟. 政體與身體: 蘇維埃的革命與身體, 1928-1937. 聯經出版. 2005: 43–. ISBN 978-957-08-2933-4 （中文（台灣）‎）. ^ Alexander Pantsov. The Bolsheviks and the Chinese Revolution 1919-1927. Routledge. 23 October 2013: 12–. ISBN 978-1-136-82893-5 （英语）. ^ F. J. Ferdinand Joseph Maria Feldbrugge; Gerard Pieter Van den Berg; William Bradford Simons. Encyclopedia of Soviet Law. BRILL. 1985: 254–. ISBN 978-90-247-3075-9. ^ Communism党史纵览. 《党史纵览》 编辑部. 2008 （中文（中国大陆）‎）. ^ 20.0 20.1 20.2 李登輝．中山鳥嶺. 亞洲的智略. 遠流出版. 2000: 99–. ISBN 978-957-32-4170-6 （中文（台灣）‎）. ^ 東北亚硏究. 吉林省东北亚研究中心. 1995 （中文（中国大陆）‎）. ^ 王加丰. 朴正熙"开发独裁"体制研究. 学苑出版社. 1999 （中文（中国大陆）‎）. ^ 黃文雄. 台灣世界孤兒經濟. 一橋出版社. 2000 （中文（台灣）‎）. ^ 東北亞發展的回顧與展望: 國際學術討論會論文選集. 正中書局股份有限公司. 2003 [8 January 2014]. ISBN 978-957-09-1566-2 （中文（台灣）‎）. ^ 陳紹英. 一名白色恐怖受難者的手記. 玉山社出版事業股份有限公司. 2005 [8 January 2014]. ISBN 978-986-7375-39-1 （中文（台灣）‎）. ^ 缅甸专集. 财经 12 1. 《财经》杂誌社. 2003 [8 January 2014] （中文（中国大陆）‎）. ^ 李輝. 在歷史現場: 外國記者眼中的中國. 知書房出版集團. 2004: 11–. ISBN 978-986-7640-30-7 （中文）. ^ 遠流台灣館／編著. 台灣史小事典. 遠流出版. 2000: 178–. ISBN 978-957-32-4161-4 （中文（中国大陆）‎）. ^ 謝泳. 儲安平和他的時代: 紀念儲安平誕辰一百周年學術研討會論文集. 謝泳(秀威代理). 1 December 2009: 149–. ISBN 978-957-41-6753-1. ^ Ilʹi︠a︡ V. Gaĭduk. Confronting Vietnam: Soviet Policy Toward the Indochina Conflict, 1954-1963. Stanford University Press. 2003: 100–. ISBN 978-0-8047-4712-7 （英语）. ^ Cheng Guan Ang. Vietnamese Communists' Relations with China and the Second Indochina Conflict, 1956-1962. McFarland. 1 January 1997: 26–. ISBN 978-0-7864-0404-9 （英语）. ^ 淡江人文社會學刊. 淡江大學. 2004 （中文（台灣）‎）. ^ 東呉政治社會學報. 第 4-5 卷. 東吳大學. 1980 （中文（台灣）‎）. ^ Jiaqi Yan. 第三共和: 未來中國的選擇. 八方文化创作室. 1992: 49–. ISBN 978-981-4327-24-4 （中文）. ^ 文藝復興. 第 59-79 期. 華岡學會. 1975 （中文（台灣）‎）. ^ Guo Jian; Yongyi Song; Yuan Zhou. The A to Z of the Chinese Cultural Revolution. Scarecrow Press. 17 September 2009: 45–. ISBN 978-0-8108-7033-8 （英语）. ^ 徐友漁. 形形色色的造反: 紅衛兵精神素質的形成及演變. Chinese University Press. 1999: 252–. ISBN 978-962-201-894-5 （中文（香港）‎）. ^ Ron Fridell. Dictatorship. Marshall Cavendish. 1 September 2007: 97–. ISBN 978-0-7614-2627-1. ^ 游梓翔 (编). 領袖的聲音: 兩岸領導人重要演講選輯, 1906-2006. 五南圖書出版股份有限公司. 2006: 123–. ISBN 978-957-11-4276-0 （中文（台灣）‎）. ^ Benny Tai 戴耀廷. 憲政‧中國: 從現代化及文化轉變看中國憲政發展. Hong Kong University Press. 1 December 2011: 55–56. ISBN 978-988-8083-91-6 （中文）. ^ Zhichu Ren; 文思永. 胡锦涛传. Mirror Books USA. 2002. ISBN 978-1-932138-04-7. ^ 61.0 61.1 苏绍智（原中国社科院马列所所长）. 中共向何处去？江泽民允许资本家入党之后. BBC. 2001-08-29 [2013-12-26] （中文（中国大陆）‎）. ^ Holbig, Heike. Ideology after the end of ideology. China and the quest for autocratic legitimation. Democratization. 2013, 20 (1): 61–81 [2013-12-26]. ISSN 1351-0347. doi:10.1080/13510347.2013.738862 （英语）. ^ Didi Kirsten Tatlow. Can China Be Described as 'Fascist'?. New York Times (New York Times). 2012-10-31 [2014-01-02] （英语）. ^ Didi Kirsten Tatlow. 中国能被描述成“法西斯”吗？. 纽约时报. 林蒙克（翻译） (纽约时报). 2012-10-31 [2014-01-02] （中文）. ^ BBC中文. 英媒：中国是法西斯主义国家吗？. BBC中文 (BBC). 2012-10-31 [2012-11-01] （中文）. ^ Becker, Jasper. 江氏政权是法西斯政权（译文）. 英国观察者杂志. 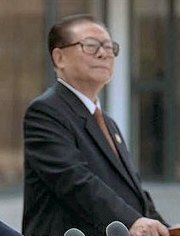 2002-11-23 [2013-12-26] （中文（中国大陆）‎）. ^ Becker, Jasper. China is a fascist country. The Spectator (英国观察者杂志). 2002-11-23 [2013-12-26] （英语）. ^ Europa Publications. The International Who's Who 2004. Psychology Press. 2003: 1876–. ISBN 978-1-85743-217-6 （英语）. ^ 王桂五; Yichu Xu; Dengju Zhao. 中华人民共和国检察制度研究. 法律出版社. 1991. ^ 林博文. 1949石破天驚的一年. 時報文化. 2009: 280. ISBN 9571350249. ^ 林祖偉. 「中國夢」與「完全極權」：歐美專家談習近平修憲. BBC 中文网. 2018-03-11. ^ MICHAEL ALBERTUS and VICTOR MENALDO, Aftermath of Revolution, Twenty-First Century Books, 2013-02-14 [8 January 2014] （英语）, The recent assassination of a leading secular opposition figure in Tunisia has cast a dark cloud on what many had hoped would serve as a model for democratic transition in countries swept by the Arab Spring. The sad fact is that many revolutions lead to renewed dictatorships. But the good news is that even a rocky and prolonged transition can produce stable democracy.